Cars and Climate: When do biofuels really balance carbon? P = net primary production; R = heterotrophic respiration. The first point is that CO2 is always flowing in and out of the atmosphere, whether or not products of the biosphere are being used to supply fuel. 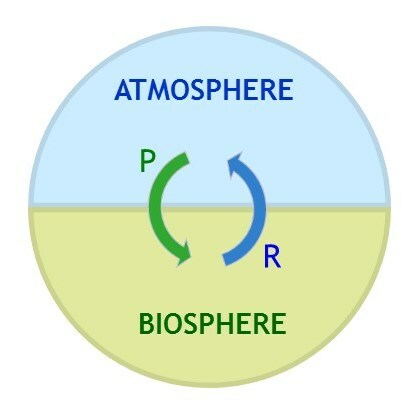 This always-circulating carbon cycle is illustrated in Figure 1, where P is the downward flow of CO2 from the air into the biosphere and R is the return flow of CO2 back up into the atmosphere. P stands for net primary production (NPP), which is the amount of carbon embodied by plants as they grow after subtracting plants' own metabolic release of CO2. R stands for heterotrophic respiration (often designated Rh), which is the CO2 released by organisms that consume plants. Heterotrophic respiration includes all the CO2 exhaled by humans and other animals as they metabolize food, but the vast majority of R is from the decomposition of biomass in soils, forest litter and crop residues. In nature, no carbon is wasted; ecologically speaking, it is all put to good use whether or not it is utilized commercially. On average, P exceeds R, which enables carbon to accumulate in the biosphere. The second point is that the total amount of carbon in the world is fixed. Otherwise put, whether as food for biological processes, CO2 in the atmosphere, fuel for motor vehicles or in living biomass such as forests, wetlands and other carbon-rich ecosystems, carbon utilization occurs in a closed system. This point might seem trivial (it's just conservation of mass), but unfortunately it is neglected in the lifecycle analysis (LCA) models commonly used to analyze biofuels. This error is due to the fact that those models fail to properly represent the terrestrial carbon cycle. With these concepts in mind, we can perform a simple but scientifically rigorous analysis of what happens when a biofuel substitutes for a fossil fuel. The model is depicted in Figure 2, which shows the carbon flows associated with fuel use in addition to the basic carbon cycle flows illustrated in Figure 1. Also shown is the P-minus-R difference, which is termed net ecosystem production (NEP); it is given as a downward arrow and reflects the net flow of carbon from the atmosphere to the biosphere. for biofuels to have a potential climate benefit. At the center of the figure is fuel combustion. Whether the source of carbon in the fuel is biomass (B) or fossil (F), the amount of CO2 emitted (E) when burning the fuel is essentially the same per unit of useful energy. In other words, using a biofuel (such as ethanol or biodiesel) instead of a fossil fuel (such as gasoline or diesel from petroleum) does not appreciably change the rate at which CO2 flows into the atmosphere, e.g., from vehicle tailpipes or jet engines. and it means that the change in the net CO2 flow rate from the atmosphere to biosphere must be positive. If this condition is not met, biofuels cannot provide a climate mitigation benefit. In other words, biofuel use is not carbon neutral, and that's even before considering the extra emissions involved in growing the feedstock and processing it into fuel. Moreover, it's also before considering the land-use change impacts that have become so prominent in the biofuels debate. It is the need for an increase in the net rate of CO2 removal from the atmosphere that is missed when assuming that biofuels are inherently carbon neutral. Sadly, the simplistic assumption of carbon neutrality has been broadcast widely for many years; it is also hard-coded in the lifecycle analysis computer models used to claim that biofuels reduce CO2 emissions. Because the feedstocks (such as corn and soybeans) used to make biofuels are harvested largely from land already in production, there is little or no overall increase in NEP. For example, a corn field doesn't remove CO2 from the air any faster when the harvest gets turned into ethanol than when it is used for feed and food. NEP can be increased by using crop residues to make fuel, as now being pursued at a small scale through cellulosic ethanol production. NEP then increases because R decreases, e.g., by collecting corn stover that would otherwise decompose and thereby reducing the CO2 emissions from cornfields after grain is harvested. In any case, it is necessary to do a careful, location-specific assessment of how NEP actually changes when biofuel feedstocks are produced; one cannot just assume (as lifecycle models now do) that the carbon in a harvest fully offsets CO2 emissions during fuel combustion. Ecologically speaking, the extent to which one can safely "starve the decomposers" by harvesting residues is likely to be limited. The implication is that, while it may be possible for biofuels to contribute to climate mitigation, the conditions under which they actually do so are much more restricted than is commonly assumed. Moreover, because any climate benefit hinges not on biofuel use per se, but rather on raising the net rate of CO2 removal from the atmosphere, there are likely to be other ways to accomplish that task which are less costly and more ecologically sound. DeCicco, J.M. 2013. Biofuel's carbon balance: doubts, certainties and implications. Thanks John for this useful insight. Can we ever really actually INCREASE NEP under a regime of industrial crop production? That would seem questionable. And what the increase is relative to? Relative to the amount emitted when fuel is burned? Relative to the entire lifecycle emissions of the fuel? Or to the state of global carbon cycle/climate? In any case these carbon counting schemes always seem to fall flat when a more holistic approach is taken. Many have looked at the very immediate carbon impacts and ignored indirect impacts which can be quite vast even if hard to measure, for example. Similarly, the claim that cellulosic fuels from ag residues will increase NEP also seems to suffer from narrow focus on carbon. If removing stover results in increased nitrogen fertilizer use, then the problem of C emissions may be overshadowed by increase of N2O. THere is one thing we know with certainty: Nothing comes for free, and healthy biodiverse ecosystems cannot remain standing if we continue to demand more and more “biomass” while feeding an expanding population with appetite for meat. No matter which way we count it, the limits remain. Am I missing something here? The fossil fuel use of production of corn soy and other biofuels is increasing the demand for fossil fuel consumption. There is little to no net gain in ethanol as nearly the same or more fossil fuels are burned as produced and BTUs per gallon of biofuels vs. fossil fuels is lower. Additionally, taking corn stover and other "crop waste" disrupts the soil carbon and nitrogen balances and increases the need for more fossil fuel based herbicides and fracking gas based Nitrogen inputs. Current traditional and even worse GMO crop production is a boom/bust for soil ecosytems with inevitable failure of productivity in relatively short order compared to historical organic growing methods. Additionally, GMO and traditional farmer for fuel crops is being done in such a way as to hasten the peak phosphorus bust we face within decades. Those methods decrease soil structure reducing water retention and permeation. There is no way to burn our way out of this mess with NPP or remaining soil productivity and dwindling water supplies. The whole reasoning is wrong starting from "total amount of carbon in the world is fixed". Of course that is true, but we humans live within the atmosphere and the biosphere. The only process that introduces carbon from the geosphere is fossil fuel burning. So the problem is that an increasing fraction of Earth's carbon is moving from the geosphere to the biosphere/atmosphere. That is where it causes global warming, not when it is safely undeground. 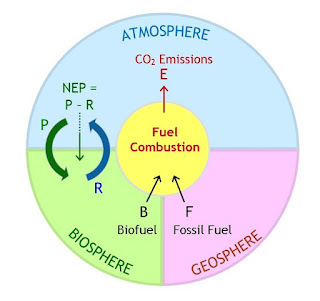 If we substitute fossil fuel burning by biofuels, then there is no input from the geosphere and the biosphere/atmosphere can remain forever at the same C content because, yes, there is conservation of mass. And if we keep the atmosphere at the same C or even lower it, we prevent further global warming. Which is kind of a big issue. Actually, we live on Planet Earth, which includes the geosphere. So one can't arbitrarily draw the boundaries around an analysis to exclude an element of the system. We human do interact with geosphere -- we mine it for fossil fuels -- and so a complete analysis has to include it. It is very common to assume, as you seem to, that introducing carbon from the geosphere is the essence of the problem. But in reality, the problem is an excess of carbon in the atmosphere caused by the amount flowing in exceeding the amount flowing out. 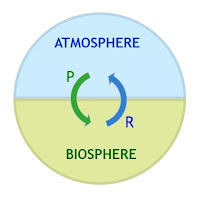 To achieve balance, one must consider all of the carbon, including both biosphere and geosphere, as well as flows into and out of the atmosphere. That's what this analysis does and it shows that merely substituting biofuel carbon for fossil carbon does not ensure that less carbon enters the atmosphere on a net basis.